The lace pillow is the base on which the lace is made. Traditionally lace pillows were made of straw or sawdust but nowadays polystyrene pillows are popular because they are lightweight to carry around. There are several different styles of pillow. The choice of pillow to use will depend on the type of lace to be made. If you want advice before the course, please contact us. Cover cloths are hemmed squares of material used to cover the edges of the pattern and the pins that holds the pattern down on the pillow. Preferrably they should be made of 100% thin, smooth weave cotton in a calm dark colour such as blue or green. Light bright colours are hard on the eyes when working on the pillow. Cover cloths can vary in size depending on the pillow and pattern used 15cm x 15 cm is a useful size as well as one or two larger ones to cover the whole pillow and keep work clean when not being worked. 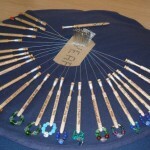 Lace can be made with a range of threads. 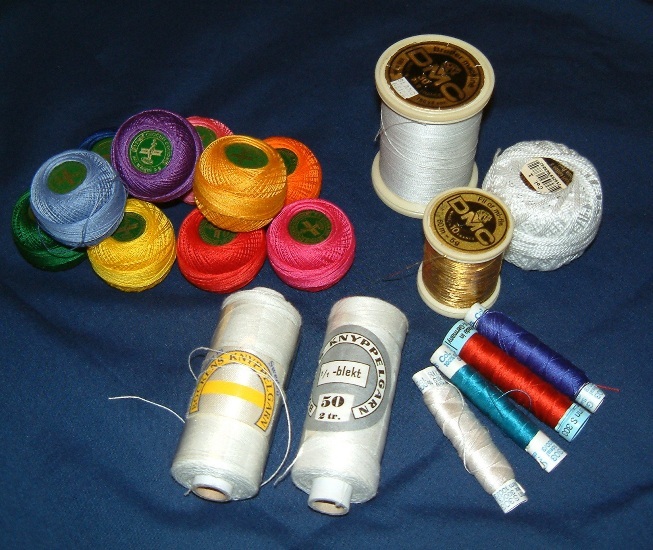 Most commonly cotton or linen thread are used, though silk and man-made fibres may also be used. 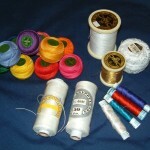 The type of thread and the thickness chosen are dictated by the pattern to be worked. The larger the scale of the pattern the thicker the thread used. Although lace is traditionally most likely to be white or ecru coloured threads are often used nowadays, particularly in contemporary creative lace. A pair of small sharp scissors for cutting thread are required. Also scissors to cut card and paper are useful. The pins used for lace making must be rust proof so they are usually made of either brass or stainless steel. The thickness and length of pins can vary and the choice may depend on the type of lace worked. For example for a Guipure, or flower lace, such as Honiton, where the pins are pushed flat to the pillow during the work short, fine pins are used. 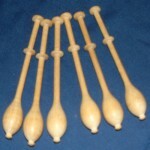 Whereas for continuous laces such as Torchon, Bedfordshire or Bucks Point longer pins may be used – thicker ones for torchon, finer for the other laces. The pattern on which the lace is made is pricked out on a firm glazed pricking card which allows the pricked holes to keep their shape even if the pattern is used more than once. The pricker is the tool used to prick the holes of the pattern in the pricking card. 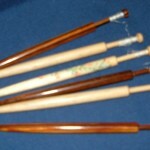 A pricker can be made by putting the eye end of a no 9 Sharps needle into a pin vice or gluing it into a wooden handle. The point of the needle sticking out should not be too long as it ‘waggles’. Some lacemakers break a needle in half and use the pointed end, discarding the eye end safely. An A4 or A5 notebook (no smaller) is ideal. It is always good to take notes so that you will remember what to do when the teacher is not around. If you are lucky they may even write or draw the notes for you! For beginners, starter kits can be supplied at cost (£25 approx). Most of these items are available for sale from the tutors or on the sales day.